The name on the canopy almost invites you to come in and book a room, doesn’t it? Albany has no more downtown hotels, as it did long ago when there were several, but now it does have a restored hotel canopy that brings back memories of that bygone era. The awning above what used to be the Ferry Street lobby entrance of the former St. Francis Hotel has been repaired, put back up and adorned with lettering that mimics what used to be there when the hotel was open. That era ended no later than the 1960s, and the canopy was clad with sheet metal, obscuring the old name. In November last year, a Portland & Western Railroad maintenance truck turning on to Ferry Street snagged the sign and mangled it. The railroad paid for repairs, and a few weeks ago the canopy was put back up. Monday was the first time I had noticed that the name had reappeared as well. The upper three floors of the building are vacant and deteriorating. 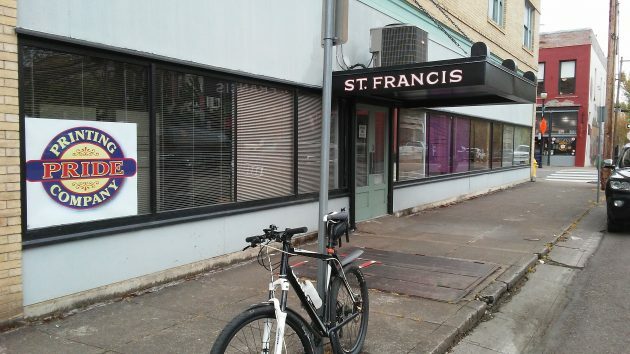 It has long been the hope of people interested in downtown revival that the St. Francis could be remodeled and used for some kind of housing. But in March, after a detailed study of the economics involved, a group of students from the University of Oregon concluded that remodeling the upper floors as apartments and the ground floor as commercial space was not feasible from a business standpoint. The likely return would not justify the several million dollars that a conversion would cost. The applicant was a non-profit, meaning the tax increment was virtually zero. And it’s still virtually zero on the Old Salem Road project. Tax Increment Financing, by definition, is a promise to the taxpayer and overlapping taxing districts that a CARA project will result in a positive tax increment. CARA knowingly took a tax generating property off the tax rolls and used it on a project that will return virtually nothing. That is fraud, plain and simple. And you being an apologist for CARA’s longstanding irresponsibility is equally tiresome. CARA made a choice to use Tax Increment Financing. TIF has a specific purpose and creates a specific responsibility on CARA to ‘invest’ public money in certain, limited ways. Your description above of the many motivations for spending is a classic description of a slush fund. When there is no limiting principle on how CARA raises and spends public money, a disservice to taxpayers and the overlapping tax districts is performed. You, and all the advocates of the CARA slush fund, should be ashamed. A perfect project for CARA, what with the imminent arrival of the Merry-Go-Round. Overflow audiences have been hinted at. Cash Bovine in-waiting. I recall Cannery Row before the bones were picked clean – enough tourists to keep bills paid with local support for meals and drinks and a night out dancing while rusted old forms, some nautical, some not, languished in the shadows where smart money could not see. When the Packard-supported Monterey Bay Aquarium opened in 1985, everything changed. The area became too fast and too expensive almost overnight. Not saying that will happen here, but the dominoes could fall just right and change downtown yet again. One big one would be the Post office block coming open for new shops. I recall inspecting the fire extinguishers working for my father’s business, Valley Fire Control in the 1960’s. Very interesting place and as I remember the elevator was very rickety. In the Hotel that is. Perfect CARA project. Indeed! Sort of a horny thought though. Imagining a modern hotel in downtown. One that is thriving, ok, making a buck or two. There is a saying “Make America Great Again”. One man’s racist dog whistle but in this case a longing dream of a bustling 50s America. Right here in little old downtown Albany.